Step into a tavern complex complete with rooms for travellers, extensive stables, and a forge for those wanderers who need to replace their weapons - the possibilities for adventure are endless with Pathfinder Flip-Mat: Bigger Tavern. With an area that's a whole 45% larger than Pathfinder Flip-Mat: Tavern at their disposal, Game Masters can now dream even bigger! This massive gaming accessory presents both exterior and interior views of this roadside way station, which can be either a sanctuary where weary travellers can restock or a trap for unwary adventurers. Don't waste your time drawing every pub table and inn room. 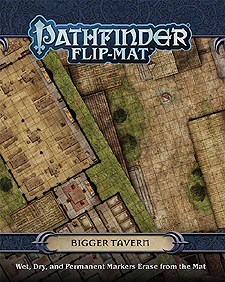 With Pathfinder Flip-Mat: Bigger Tavern, you'll be ready the next time your players belly up to the bar.